Artists familiar with art scenes in foreign cities share their insider knowledge and experience in real time at this new series of talks. This is the fourth installment in a series of articles produced collaboratively by the Tokyo Culture Creation Project and Tokyo Art Beat. In this piece, TABlog writer Rie Yoshioka takes a look at the “Talk & Cast” series of web-enabled artist talks organized by the Tokyo Art Research Lab, which is based in 3331 Arts Chiyoda, a new art center that opened in Akihabara this spring. Tokyo Art Research Lab is a talent-grooming program that nurtures art managers. It is organized by Tokyo Artpoint Project, which seeks to create and disseminate new forms of culture unique to Tokyo by bringing various people, neighborhoods and activities together through art. The Project’s past initiatives include TERATOTERA, a community-based project featured in an earlier article that focuses on the Chuo Line area of Tokyo. This talent “laboratory”, aimed at those passionate about creating Tokyo’s future “artpoints”, will offer lecture-based courses by instructors with a wide variety of backgrounds, including Tetsuya Ozaki, publisher and editor of the culture web portal Real Tokyo, and art coordinator Aki Hoashi. These classes will examine art-centered projects from a diverse range of perspectives. Highlights include focused live-in seminars organized by Arts and Law, a team of lawyers dedicated to offering legal advice and support for artists, as well as an intensive lecture series conducted by Arts Initiative Tokyo, a nonprofit organization known for their art management and curatorship courses. One of these programs is Talk & Cast, a series of talks that invite artists and art coordinators with first-hand experience of art scenes in foreign cities to give presentations on recent examples of art projects abroad, as well as the social contexts and situations behind them. Audio recordings of these talks will later be made available as podcasts. As an experiment in web-based dissemination, Talk & Cast hopes to create an Internet archive of information that compiles actual examples of various art projects taking place around the world. So far, three public recording sessions have been held, featuring artists in their twenties and thirties – Yusuke Asai, Yoshinari Nishio, and Wah, an artist collective led by Kenji Miniamikawa. The talks are moderated by Tsukasa Mori, director of the Tokyo Artpoint Project. 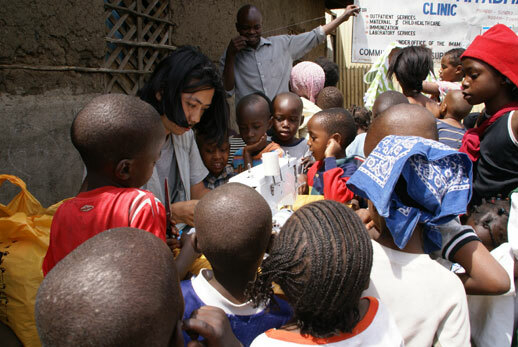 Asai spent time in Bihar, India’s poorest state, while Nishio did a stint in Nairobi, the capital city of a country currently struggling with a national unemployment rate of more than fifty per cent. Wah, on the other hand, did a residency in Holland’s second city, Rotterdam. These three artists, each with their own motivations, agendas and approaches to engaging with their chosen communities, shared the results of their residencies and personal experiences with the audience. Tokyo Artpoint Project’s first recorded podcast was of a talk given by Yusuke Asai, who had returned from his residency in India. 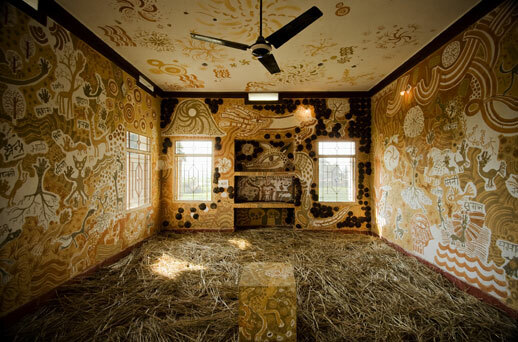 Asai, known for his wall paintings made out of mud and masking tape, lived and worked in Bihar, said to be the most impoverished state in India, where he participated in the Wall Art Festival in Niranjana School 2010. 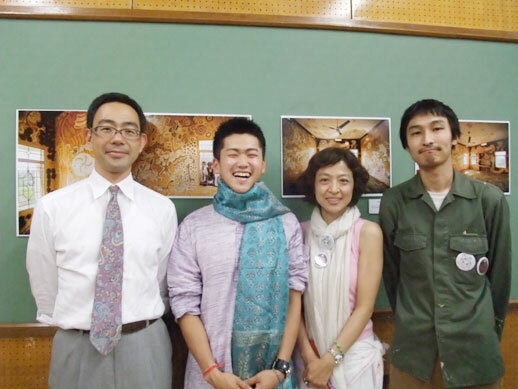 Also invited as guest speakers were Akiko Okuni, one of the festival organizers, and Kazunori Hamao, who had returned from India for a short vacation. The Wall Festival was first conceived when some university student volunteers who donated an elementary school to an Indian village started to wonder if there was something else they could do to make the villagers happier. This village was located in a part of India where many children work to support a family instead of going to school – a social context completely different from Japanese society. More on how the project was founded and executed can be found on the podcast (in Japanese only; a movie that documents how the festival was put together in Bihar can also be found on this YouTube video). 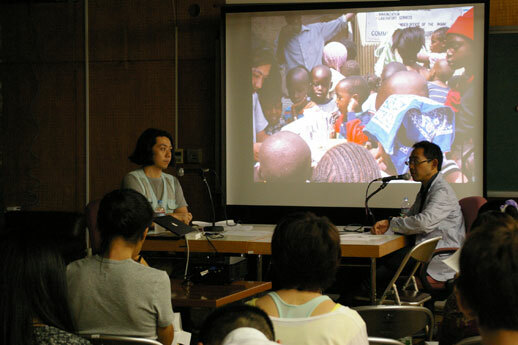 The second guest speaker was Yasunari Nishio, who spent time in Kenya participating in the Nairobi Art Project. Nishio, whose art deals with the act of dressing, costumes and the process of communication, started this project in 2009. He maintains a branch office of his Nishio Workshop in Nairobi, and has already organized two editions of the Nairobi Art Project. For this year’s second installment, Nishio collaborated with the local residents, stitching together old clothes in order to produce a huge patchwork quilt that looked as if it had been custom-made for a steam locomotive. 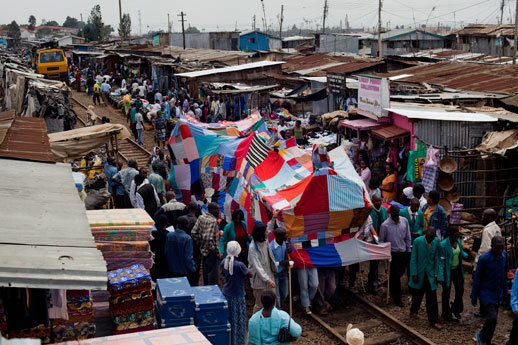 After the quilt was completed, he staged performances by having groups of people “wear” the quilt while standing on Kenyan national railway tracks. 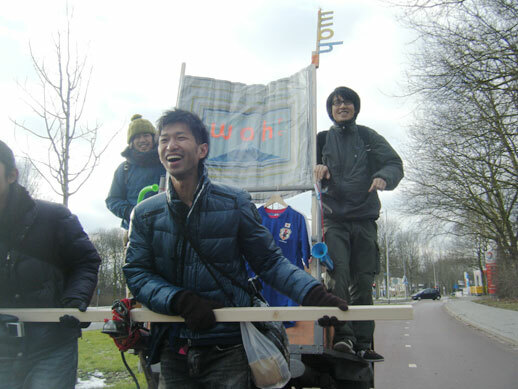 Apparently, the project began to gain momentum when Nishio started knitting quilts on the side of the road in the daytime, attracting the interest of passers-by who offered to give him a hand. The third presentation was given by Wah, a three-man artist collective who recently completed a residency in Holland. Wah organize one-off interactive activities by going out into the streets to recruit participants, doing improvised renditions of various ideas that they come up with together, or ones inspired by the particular city they find themselves in. Their extravagantly whimsical imaginations have led Wah to make heroic efforts to realize their outlandish schemes –- their musings on underground houses inspired them to actually try to bury a house beneath the ground, while a fanciful desire for a “Sumida River Golf Club” resulted in them launching a boat on the river that was big enough to play golf on. 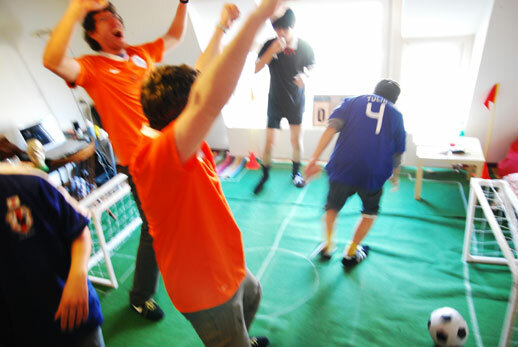 In Rotterdam, Wah carried out a plan to stage a soccer match in the middle of a house. Although Minamikawa admits that English was not his strong suit, the brainstorming process with his collaborators went surprisingly well. The residents of Rotterdam had their own ideas about what art meant, and gave Wah advice on how to stage an art project that conformed with European standards and expectations, leading the three artists to reconsider their own personal approaches to “art” within the context of their practice. All three public recording sessions featured presentations by speakers that revealed how they lived in their host communities as “artists”, the ways in which the locals welcomed and accepted them, as well as the cultural differences they encountered and the ways in which they responded to them. The recording sessions were held in Tokyo Artpoint Project Room 302, one of the spaces located within the 3331 Arts Chiyoda complex. Questions from the audience were fielded at the end of each talk, and radio program-style Q&A sessions were also held. Audiences can enjoy the talk after the fact through the podcasts, but nothing beats the experience of a live event. An artist Tatzu Nishi’s talk was recorded on October 18. Upcoming talks will feature guest appearances by Shinji Ohmaki, as well as curator Fumihiko Sumitomo — a lineup that promises to deliver some very interesting presentations and podcasts alike. TABlog writer Rie Yoshioka: After working as an assistant to an art producer, she starting working as a freelance exhibition organizer, editor and writer mainly for web-based publications. Has been organizing the Gallery Box series of exhibitions at Yokohama Bay Quarter since 2010.